This post falls into the category of better late than never. 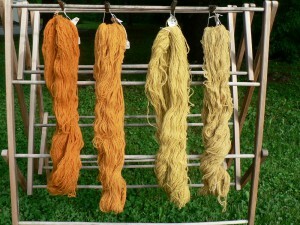 Over a month ago, now, I did a natural dyeing demo at the Massachusetts Sheep and Woolcraft Fair in Cummington, MA. It was a very rainy, windy and cold weekend. The high on Saturday was about 40. They were forecasting snow flurries for the hilltowns that night. Sunday was a bit better, with a high around 50, but still very rainy. 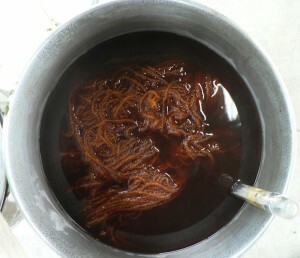 Nevertheless, intrepid visitors showed up, and I had some great conversations with people about their favorite dyeplants (jewelweed and dahlias, which I have never tried) and their favorite ways of storing valuable dyebaths (in the freezer, which alas our freezer isn’t big enough to do). I focused on dyeplants that can be found or grown here in Massachusetts. 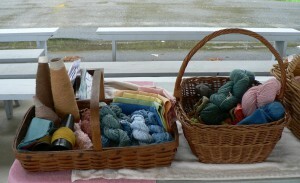 Here are the baskets with my samples of wool yarns. 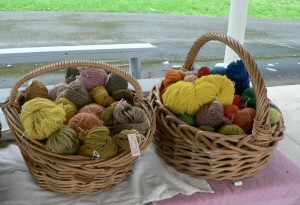 The one on the right shows yarns dyed with cultivated plants (cosmos, woad, madder, weld, etc.). The basket on the left shows wildflowers (Queen Anne’s Lace, tansy, black walnut, umbilicate lichen, purple loosestrife, etc.). 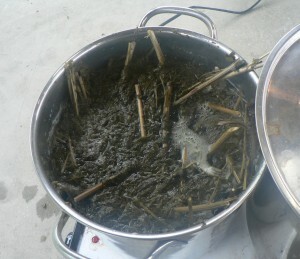 The two baskets below show other fibers. Protein fibers in the basket on the right (mohair, silk, alpaca, wool-blends) and cellulose on the left (cotton, linen, and cotton-linen blends). For the demo I used orange cosmos (frozen) and tansy (dried leaves and stems, no flowers). 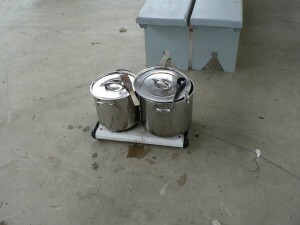 Here was my set-up. I was in the Pavillion at the Cummington Fairgrounds, which has a cement floor, a roof, and decent electrical wiring. It doesn’t have walls, so it was a wee bit windy and wet. I ran a long extension cord to the wall, threaded under the benches so no one would trip over it. From left to right: first cosmos bath, cosmos exhaust, first tansy bath, tansy exhaust. Nice cheery colors to offset the dark weather that weekend.